Multiple Chemical Sensitivity (MCS) is a medical condition characterized by a heightened sensitivity to chemicals. People who have MCS become ill when exposed to a variety of chemicals, many of which are commonly encountered in everyday life. Some people have only mild chemical sensitivities, while others have a more severe form of the illness called MCS. 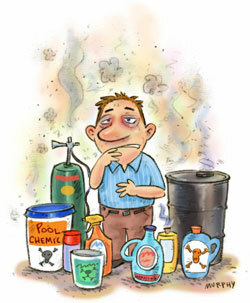 Substances that frequently cause symptoms in chemically sensitive people include pesticides, perfume/cologne and other scented products, fresh paint, new carpets, many building materials, solvents, fresh ink, smoke, vehicle exhaust, industrial fumes, and many cleaning products. Other scented products include air “fresheners,” fragrance-emitting devices, fabric softener, potpourri, incense, essential oils, and most soaps, shampoos, hair products, skin lotions, and laundry detergents. Symptoms can occur after inhaling, touching, or ingesting these or other substances. Reactions to scented products can occur even in people who cannot smell them. Because people with MCS react to chemicals at levels that ordinarily do not affect others, chemical sensitivity is similar to an allergy, but the symptoms and mechanism are not the same as those of traditional allergies to pollen, animals, and dust. Many of the above substances can make anyone sick at high concentrations, but chemically sensitive people can be harmed by exposures to even minute amounts. While some of the symptoms reported by people with MCS are similar to known toxic reactions (such as those listed on Material Safety Data Sheets), they can occur at exposure levels considered safe for the general population. Additionally, many chemically sensitive people experience symptoms that are vastly different from typical toxic reactions. This individual variability and exquisite sensitivity can be so pronounced many scientists and doctors find it hard to accept as real. It should be noted that the full range of toxicity of most chemicals is not known. Of the more than 80,000 commercial chemicals in use today, only a small fraction have been adequately studied. In addition, little is known about the cumulative effects of chemical exposures and the effects of being exposed to more than one chemical at a time. Despite this lack of information, workers and the public are often falsely reassured of the safety of chemical exposures. Exposures to pesticides and solvents are most implicated in causing MCS. The types of substances that typically trigger symptoms in people with MCS are synthetic chemicals, such as those found in pesticides, plastics, and fragrances (most are manufactured from petrochemicals) and petrochemicals themselves, such as fuels and solvents extracted from crude oil or coal tar. Exposures to low levels of gases like nitrogen dioxide, carbon monoxide, and hydrogen sulfide (common components of outdoor air pollution) can also be problematic for people with MCS, as is exposure to chlorine and combustion products. Lead, mercury, and other heavy metals can contribute to the development or aggravation of MCS as well. MCS frequently involves imbalances in a person’s nervous, immune, and endocrine (hormonal) systems, as well as impaired detoxification abilities. Food intolerance is common and may be so severe that a person’s diet is limited to only a few foods. Medication intolerance is also common. A person with MCS may react to mold, pollen, animals, and dust, although the symptoms may be different from those of traditional allergies. Brain reactions, characterized by difficulty in thinking or speaking, are also common. People with MCS may also react to naturally-occurring chemicals like skunk musk, flower essences, and tree sap. In addition, some people with MCS are sensitive to electromagnetic fields. They can be made sick by exposures to cell phones and towers, computers wireless telephones and utility meters, other wireless devices, fluorescent lights (including CFLs), microwave ovens, other electrical appliances, battery re-chargers, dimmer switches, and security and scanning equipment. It is not uncommon for people with MCS to also have chronic fatigue syndrome (CFS) and fibromyalgia. It is not yet known whether these are separate diseases or whether they represent different manifestations of a common underlying problem. The presence of candida syndrome (an illness thought to result from the overgrowth of, or hypersensitivity to, C. Albicans or other candida strains) is also common. Some people with MCS also have chronic Lyme disease. http://aesolutions.info/wp-content/uploads/2016/04/main-logo_360_II-1.png 0 0 AxisAdmin http://aesolutions.info/wp-content/uploads/2016/04/main-logo_360_II-1.png AxisAdmin2013-10-20 20:44:572014-04-13 13:59:58What is MCS?